RadCardView allows you to create and use your own custom visual items. This article demonstrates how to achieve it. This can be done by making use of the CardViewItemCreating event. The following example demonstrates creating a visual item with a checkbox in it. The checkbox itself is an editor and in order to customize it we need to extend the CardViewItem and CardViewEditorItem classes. Back in our form we need to populate some sample data for the checkboxes as well as subscribe and handle the CardViewItemCreating event. 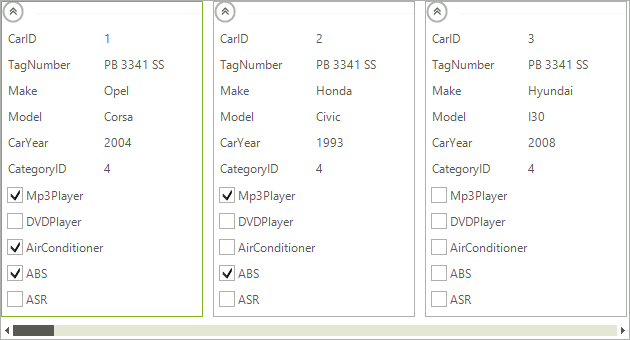 For the purpose of this example we are data binding the control to the SofiaCarRental database which is available in the installation folder of the suite.